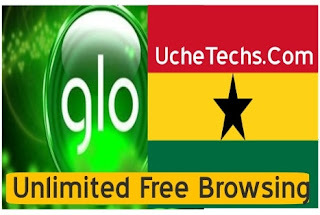 It's has been long UcheTechs Blog updated Ghanaians with Free Internet update, so today, I have remembered you guys and will very much focus my attention on Ghanaians Free browsing for MTN, Glo and Vodafone. 4. Glo Portal and Select Unlimited Plan, Click Buy (With No Airtime), it will purchase. 5. Check Data using *555# > select 7. This is how to enjoy the Latest Glo Ghana Free Browsing 2019 Trick Tutorial For Free on any Phone that has an Internet browser in Ghana Only. This tweak is Unlimited and Free, works as of the time of this post, might stop anytime from now, share and enjoy. I tried it today but step 3 isn't working. And l couldn't purchase the unlimited data plan.